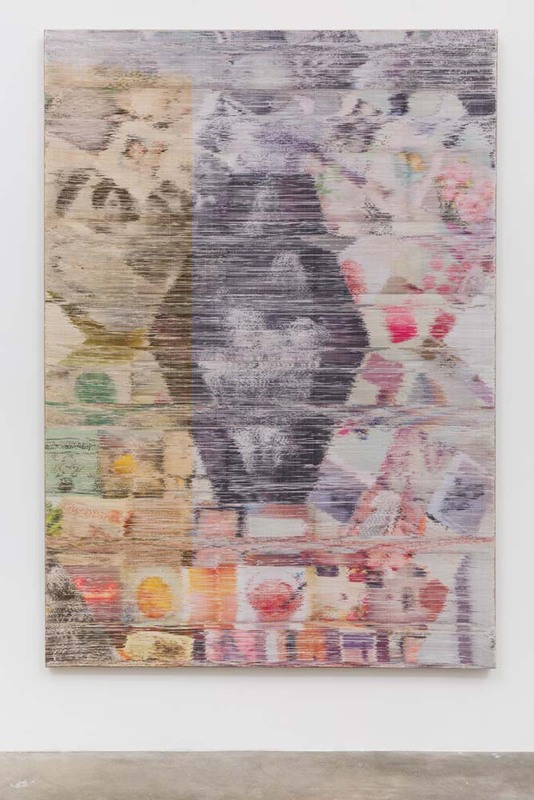 Anat Ebgi is please to announce Margo Wolowiec, a solo exhibition of new works by Margo Wolowiec opening April 19 and on view until May 31, 2014. 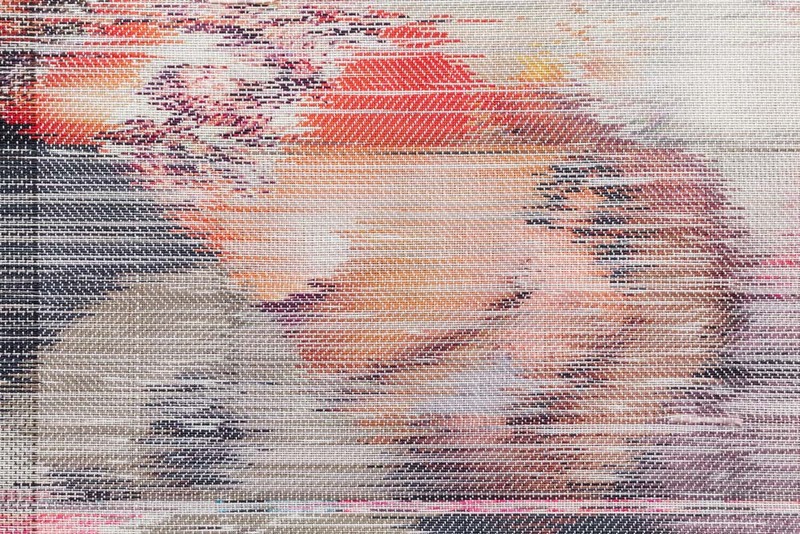 Wolowiec’s woven pieces are complex canvases comprised of digital images that the artist has culled from social media sites. 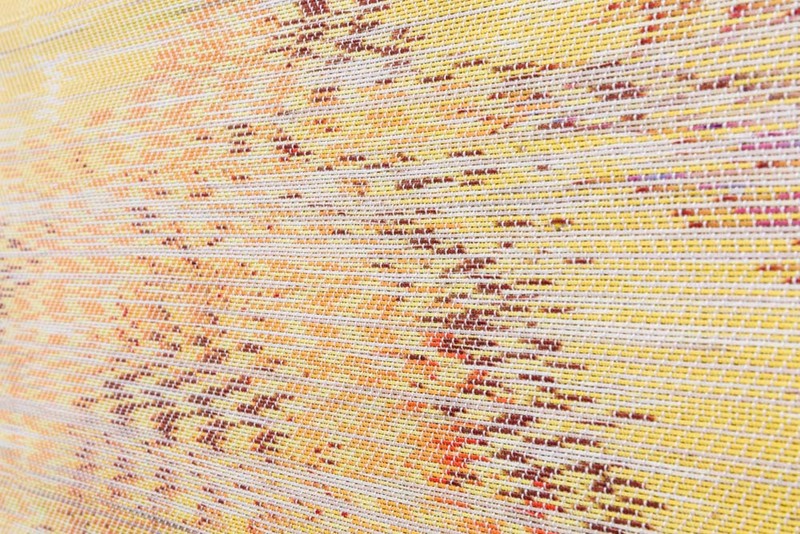 Each selected image is printed onto strands of thread pixel by pixel through a dye-sublimation ink process and hand woven to create a solid textile. 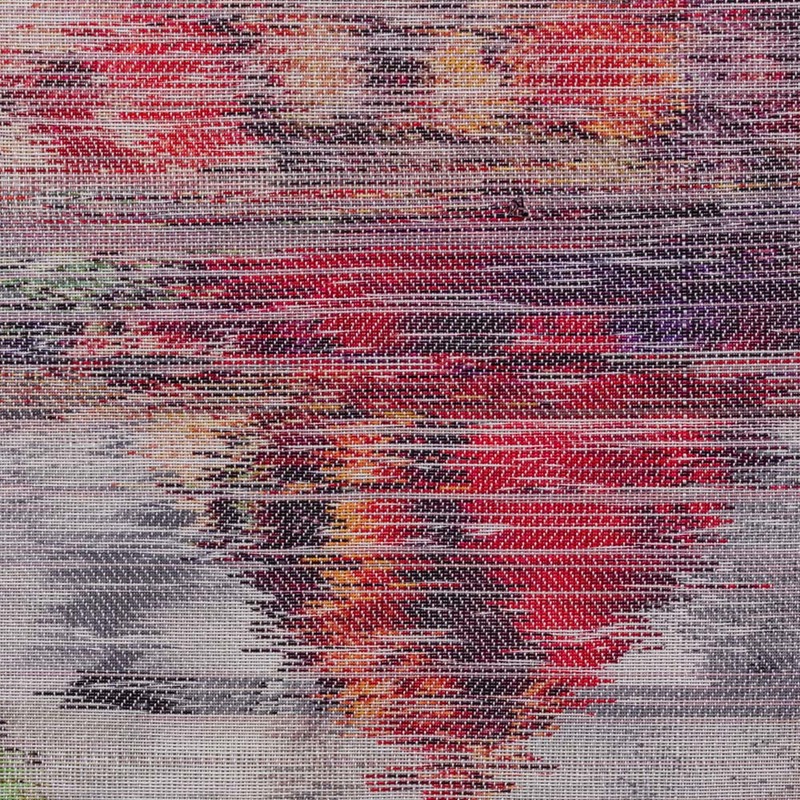 Wolowiec creates the intricate compositions through rigorous formal concerns pulling each image from her digitally-sourced archive. 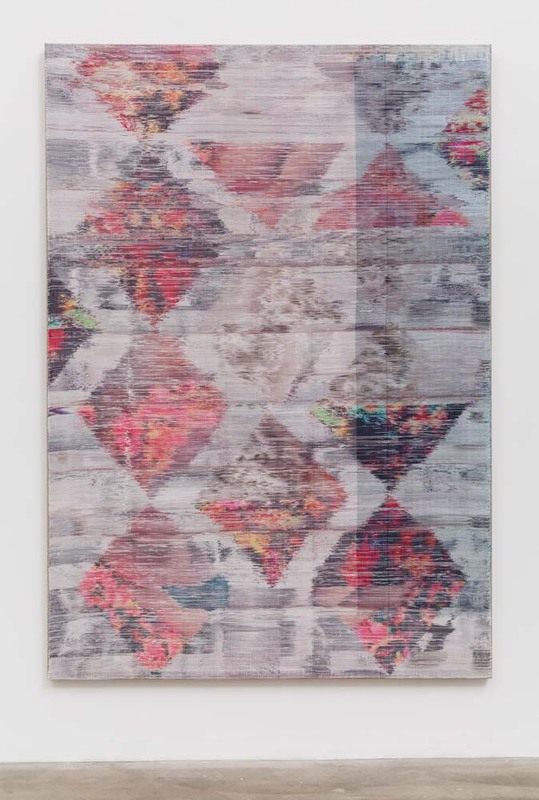 Her earlier work features images in gridded compositions that reference the lattice-like process of weaving. 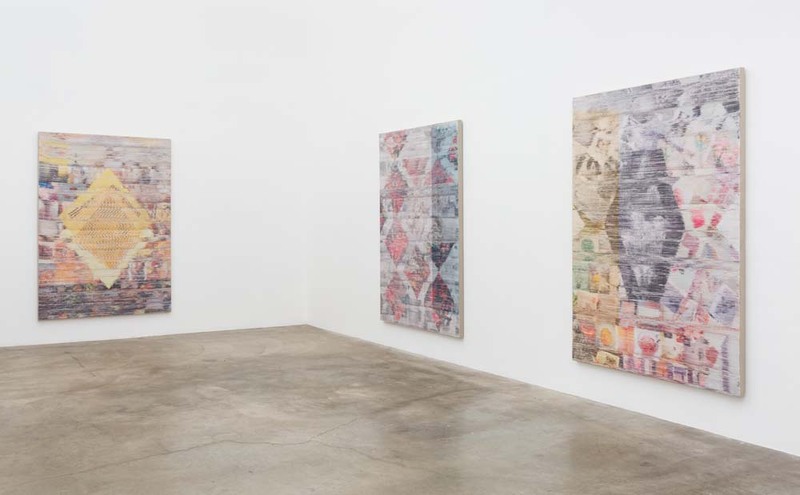 This exhibition marks an evolution in Wolowiec’s practice. 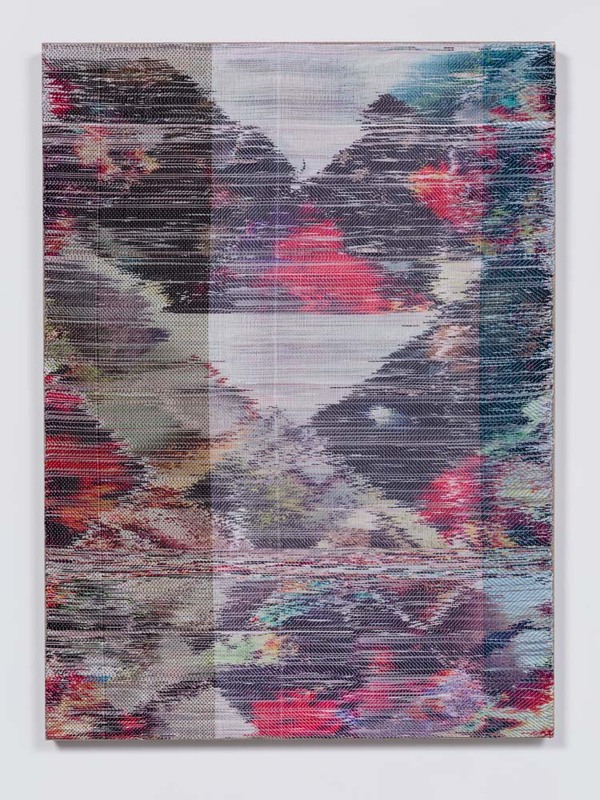 Referencing patterns of traditional Navajo rugs and Bauhaus weavers, the large-scale works in this exhibition move fluidly in and out of various geometric structures, breaking a strictly gridded logic and allowing for a more painterly approach. 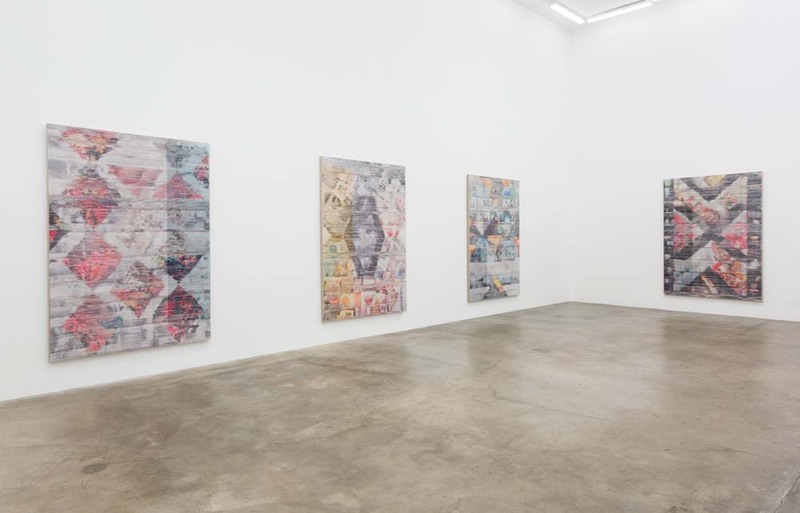 Wolowiec freely inserted her own hand in the appropriated images, heavily manipulating them throughout her process. 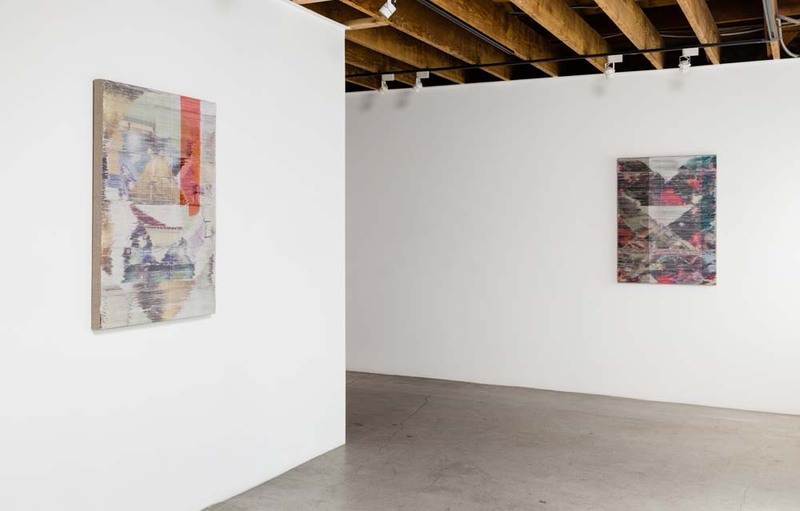 In this new body of work, the source images are re-scaled, re-colored and subjected to the artist’s formal decisions. 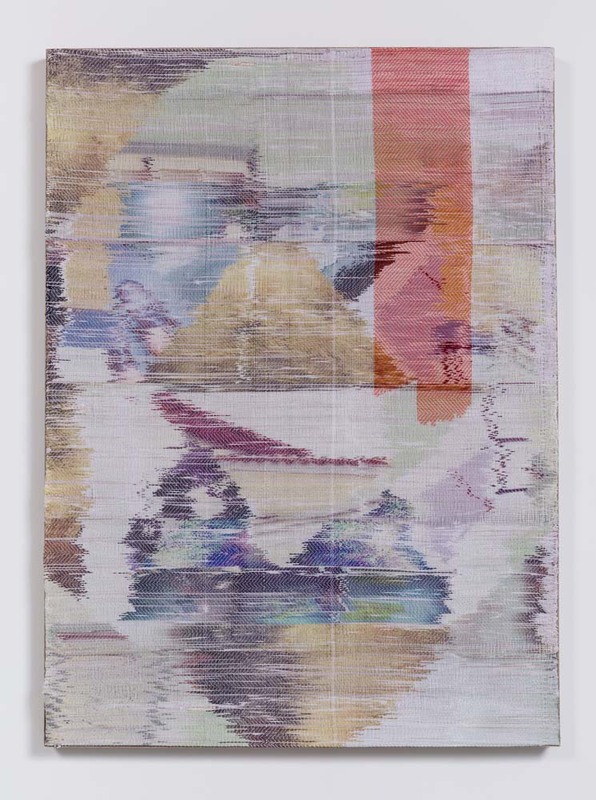 Along with digital manipulation of the images, Wolowiec paints directly onto the interlocking threads of the weavings. 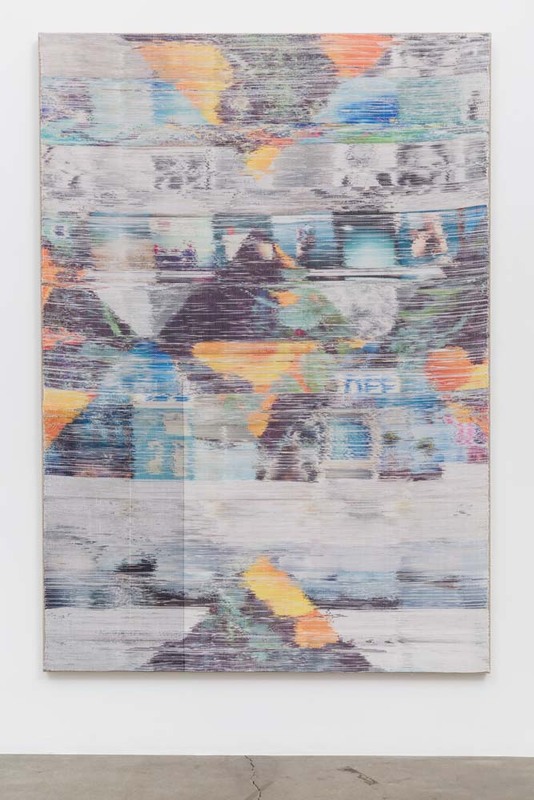 The interventions Wolowiec has taken with these images provides another layer of abstraction and distance from their original sources. Traditional Navajo woven rugs are known for their direct relationship between the weaver and their culture. 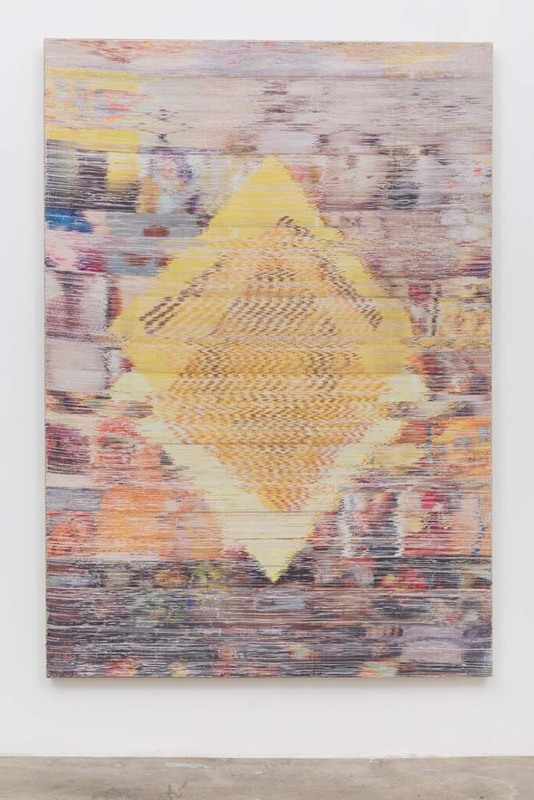 In the same way, Wolowiec’s weavings are a tangible manifestation of the image-saturated digital culture of social media outlets that dominate today’s society. 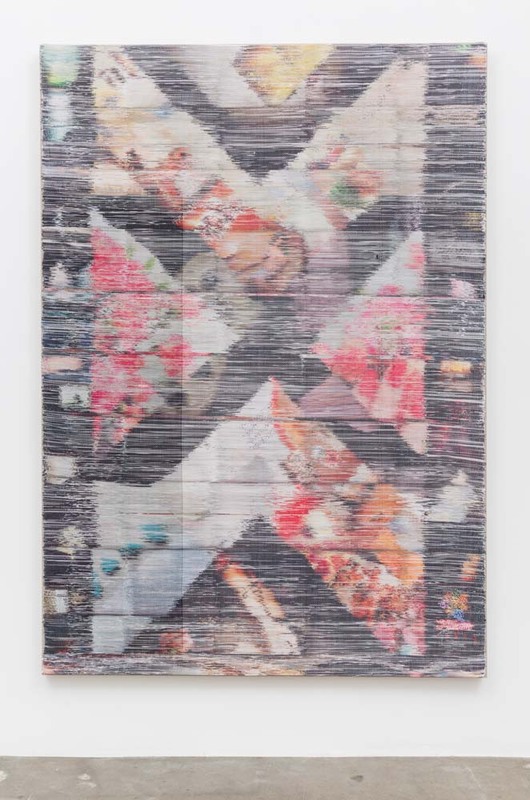 The material translations and anxiety-ridden abstractions of these ephemeral images literally ties them to physical reality like the bonds between the threads themselves. 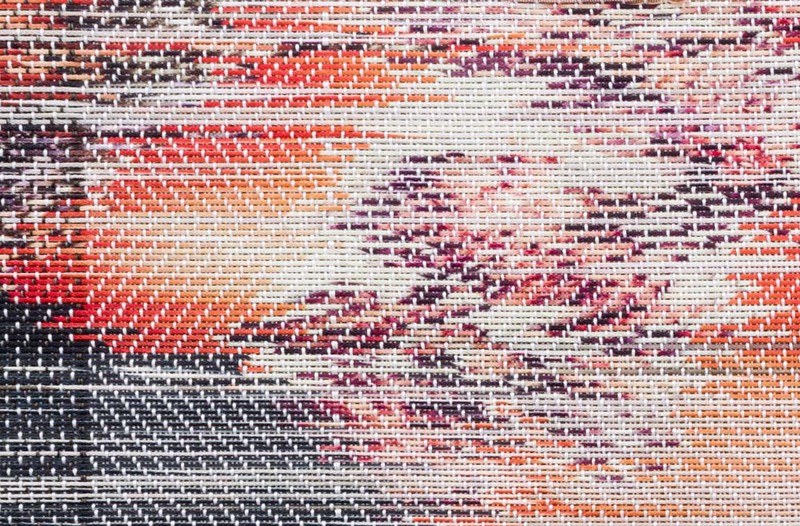 Leah Ollman, “Margo Wolowiec’s modern weavings based on tradition and trash,” L.A. Times, May 9, 2014. “Margo Wolowiec” reviewed in My Art Guides.